DJI Phantom Quadcopter – the first true mass-market Drone! 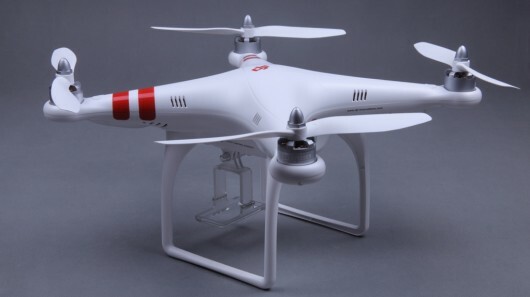 The new Phantom 2 Vision + is reviewed extensively in this article here. There is also a number of discussions about the Phantom on our forums – here is an ongoing mini-review with hints, tips, etc. Note – This article reflects our philosophy of Drone Information “for the rest of us” – assuming that most of us are just getting started in our research and quest for knowledge. You can certainly find more complete reviews, but here at Droneflyers we pride ourselves on providing the Executive Summaries which will head you in the right direction! This is also the first article to present our new DroneFlyers Rating System (DRS) – which is more carefully defined at this page. Basically, we indicate the level of flyer which the drone or equipment may appeal to as well as the type. The new (2013) DJI Phantom represents, in this authors opinion, a major milestone in the adoption of consumer level drones. This is a Quadcopter that, just a few short years ago, would have been impossible to build. Similar vehicles have been built in the last two years, but they are usually in kit form and require time, patience and mechanical skills. The Phantom is sold RTF, or Ready to Fly, complete with transmitter, advanced navigation and software control and the ability to lift high quality cameras for video and still photography. The DJI Phantom is an object of Desire! Open the box and you see a quad that LOOKS like a consumer product! No bundles of wires strapped to exposed framing with cable ties, but rather a finished and sleek aerial vehice that is ready to put into action. The manufacturer, DJI Innovations, is solidly grounded in this business and is well regarded, making the purchase less of a chancey maneuver as with a “here today, gone tomorrow” multirotor company. The price, about $700, represents a very good value in a mid-sized drone. It even comes with a basic camera holder! With the addition of a camera, you will be ready to take some nice footage. As an example, here is some footage from a Phantom taken with a GoPro ($200) camera. As a comparison, the footage below is taken from a inexpensive Keychain Camera ($12 to $55). Note that the keychain cameras take decent video in good lighting conditions! As our rating system shows, this Quad appeals to virtually ALL levels of the multirotor market. While it should not be the first Quad you own, it could easily be the 2nd or 3rd machine you purchase once you learn the basics. The intelligent flight controls should help you avoid many common mistakes and the great videos which DJI has produced on the Phantoms operation should put you into the pilots seat quite quickly. As always, newer pilots should practice above a soft surface – tall grass, for example, and keep the Quad within a few yards until they understand it’s operation. Those who buy from a local retail shop may be able to get some lessons from the store personell or team up with existing owners or a local flying cub for tips and hands-on stick time. DJI has made a series of videos for the Phantom which should be watched by any prospective customer and owner. They show many of the advanced features which this article mentions. What is the payload of the Phantom DJI? How much can the DJI Phantom Quadcopter effectively lift? The Phantom has a effective payload of about 200 grams and a range of about 300 meters, both of which can likely be extended by modifications. For reference, a GoPro 2 or 3 out of the waterproof case AND a pan/tilt assembly could easily be lifted by this quadrotor. Same goes for Sony’s new action cam and many lightweight sports and other cameras. It also has the ability to fly back to home, using GPS, when radio contact is lost – a feature which is likely to save many owners from aggravation! How fast with the DJI Phantom Quadcopter fly? In terms of mobility, DJI claims that the Phantom Quadcopter can fly at speeds up to 10 meters per second (horizontal flight) , which translates to over 20 miles per hour (MPH). However, given the battery life and energy required to travel vertically, don’t expect to fly more than a mile or two from your ground location. Check local laws and codes before attempting long distance flights! The maximum vertical speed is given as 6 meters per second, meaning it can rise to 100 feet in as little as 6 seconds! Summary – although not an inexpensive package, the Phantom represents a major step in the world of RTF mid-sized multirotors. Steve Jobs said of the first Apple Macintosh Computers “These are the first computers worthy of critism”. The Phantom fits into the same category and is likely to be the bellwether for what is to come in the next year. Customer Caution: Please check FIRST to see that replacement parts are easily and inexpensively available before purchasing this or any quadcopter/drone. The best drone isn’t any fun when a $12 part is keeping you from flying! Our congratulations to DJI Innovations for seeing the future and then building it. Here is an Amazon link where you can purchase a DJI Phantom – note that you are usually (hopefully) purchasing from an actual hobby shop through Amazon, which is nice because you may get some support in with the deal (when you need help later!). NOTE: Those looking to lift much heavier payloads should consider DJI’s Spreading Wings S800, a more professional platform which can lift 4X or more weight than the Phantom. Of course, you will also spend 3-4X as much! Note that a Hexacopter may have the ability to keep flying if one motor fails, while a quadcopter will likely come crashing down. As with all of our blog articles – this will be added to, edited, discussed, etc. in a thread on our new forums. Click here to see the additions and updates!